Dr. Tadeusz Malinski receives the Grand Gold Medal by the Society of Arts-Sciences-Letters in Paris. Dr. Tadeusz Malinski, Ohio University’s Marvin White Chair and Distinguished Professor, was awarded with the Grand Gold Medal by the Society of Arts-Sciences-Letters (ASL) on June 13 in Paris, France. 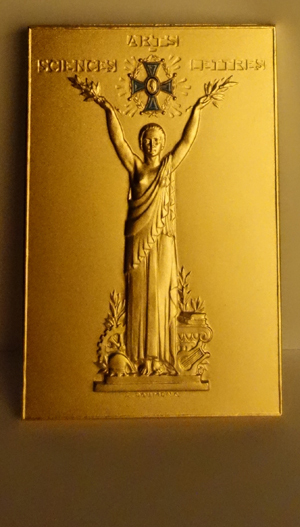 The Grande Medaille d’Or is a very prominent international award given annually to three world-renowned artists, scientists and writers in recognition of their outstanding contributions to humanity. This year, the Grand Gold Medal was presented to an impressive class of three unique and worthy recipients. 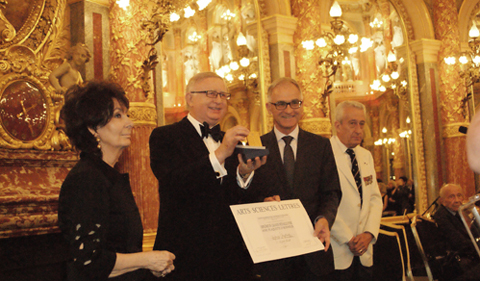 This, the Society’s 100th anniversary celebration and ceremony of the Grande Medaille D’Or, was held in the famed Opera Hall of the eminent Le Grand Hotel, Paris. Malinski received this award for his contribution in biochemistry and medicine – specifically for his research and discoveries in cardiovascular and neurodegenerative diseases and for being a pioneer of nanomedicine. In the past, this Grande Medaille d’Or was awarded to very prominent scientists and artists, including several Nobel Laureates. Some of the previous award winners include: Madame Maria Curie, Albert Schweitzer, Frederic and Irene Jolliet Curie, Louis Lumiere, Yehudi Menuhin and many others. Malinski has been the recipient of more than 30 international scientific awards and distinctions. The Grande Gold Medal is his second major award this year, after he received his fifth Doctorate Honoris Causa in medicine from Poznan Medical University in Poland. Please contact me at your convenience about the Grande Medaille d’Or. Wikipedia lists 1997 as the year of the first Grande Medaille, but I have a newspaper clipping that states Gaston Ramon, Honorary Director of the Pasteur Institute, was the first biologist to receive the first Grande Medaille on 14 April, 1959. Please clarify the apparent contradiction if possible. I am not able to write in French so I cannot contact the French Academy of Sciences directly to inquire on my own.